If you are new to developing Servlet with Tomcat and Eclipse, you can read this page before proceeding with this example. 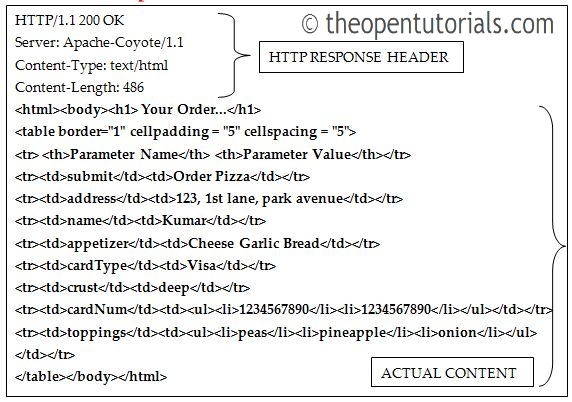 This example explains how to read all parameters in HTML form using Servlet. 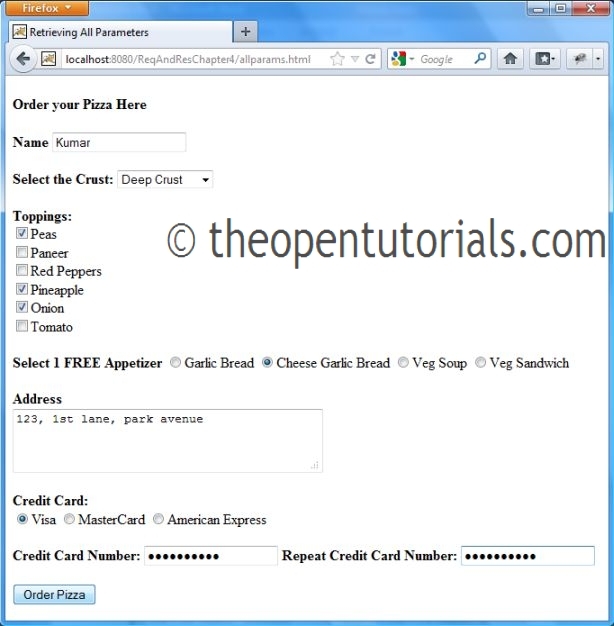 In this application we create a simple Pizza order form which allows user to order Pizza by filling the HTML form. 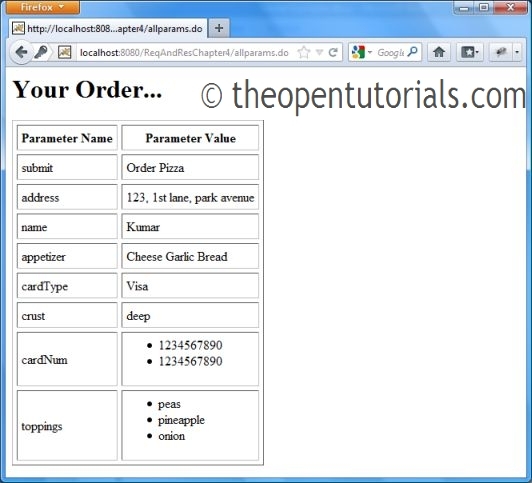 The form is submitted to the Servlet which reads all the parameters and displays the details filled by the user. 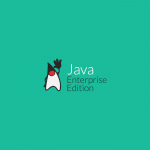 We use Eclipse IDE for Java EE Developers and Apache Tomcat to run the Servlet. 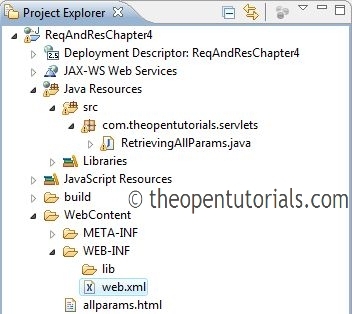 The method getParameterNames() from javax.servlet.ServletRequest is used to get all form data. Returns Enumeration of String objects containing the names of the parameters contained in this request. If the request has no parameters, the method returns an empty Enumeration. For Servlets, parameters are contained in the query string (GET request) or request body (POST request). The order in which getParameterNames() returns parameters can be different than the order in which they appear in the HTML form. The complete directory structure of this project is shown below. 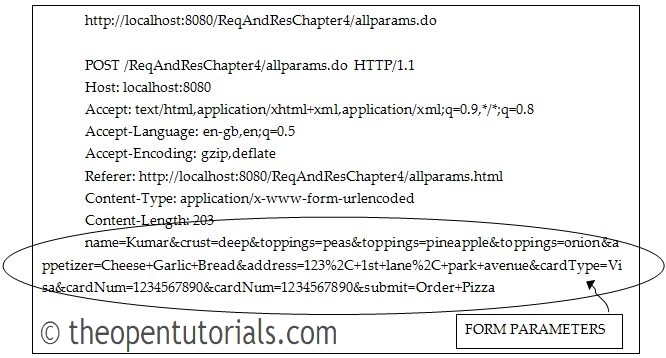 Web client (browser) requests the server/container for the HTML file (allparams.html) through request URL. Container responses with the actual content of HTML file along with HTTP response headers. 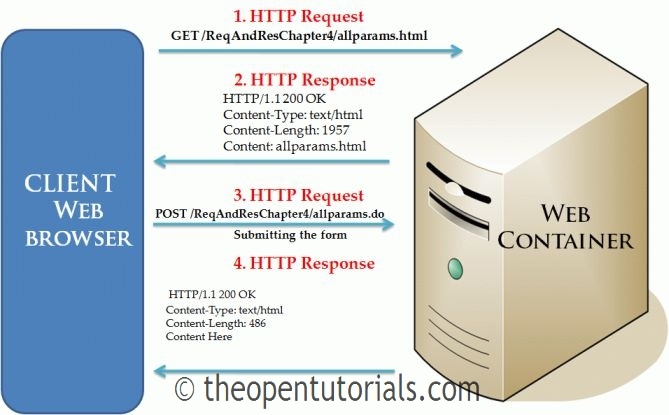 When the user submits the form, web client sends request to the Servlet along with all form data in the body of HTTP header since it is a POST request. Servlet uses getParameterNames() to get all form parameters and responds with the actual HTML content. Sample HTTP request and response headers using these add-ons is shown below. Form parameter in Request body, since it is a POST request. To develop and run this example with Tomcat and Eclipse, refer this page.